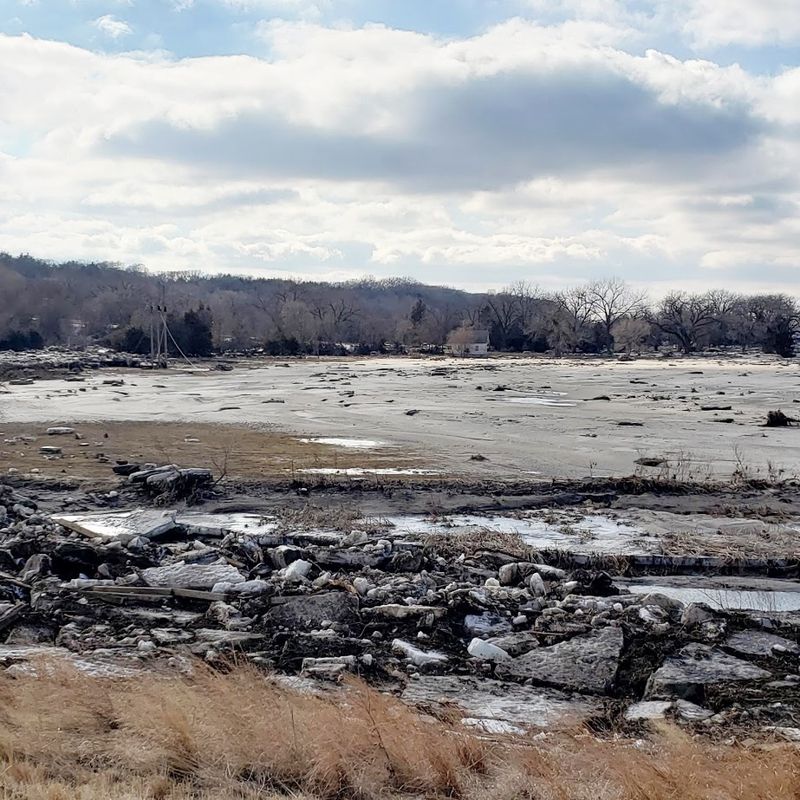 In the words of the immortal Yogi Berra, “It’s like déjà vu all over again.” At least that’s the way it seems for some farmers adversely affected by the 2011 Missouri River flood. I hope our current flooding will not be the duration of the 2011 flood; it definitely impacts many more farmers over a larger area. Even if the flooding is short term, there are still some important things we learned about bringing flooded fields back into production in 2011 that are just as applicable today. From our experience in 2011, farmers found that they needed to work on things in three stages to repair flood-damaged fields. 1. Remove debris and sediment. We grouped debris into two general categories: plant material and other debris. The kind of “other” debris will make a difference on how it is handled. Plant material, primarily corn stalks and trees, can be burned on the tract of land where it was found (if it is zoned agricultural) and the ashes buried there. If a layer of corn stalks or other crop residue isn’t too deep, it can be incorporated into the soil with normal tillage operations. One concern, and this will be a recurring theme, is to not perform tillage when the soil is too wet. This will cause compaction and create more of a problem than it solves. Also, burying high-carbon crop residues may temporarily tie up nitrogen in the soil as microbes break it down. Other debris we encountered varied from a lot of smaller “junk” such as tires, posts, and boards to propane tanks and vehicles to wooden decks, cabins and whole homes that had floated into fields. There are two options for this type of debris. It can be buried onsite if the land is zoned agricultural, or it can be taken to an approved landfill. In the case of buildings, an asbestos inspection may be required by the Nebraska Health and Human Services (NHHS). Call 402-471-0386 to see if you need an inspection. For other information on handling miscellaneous debris, contact the Waste Management Section of the Nebraska Department of Environmental Quality (NDEQ) at 402-471-4210. 0-2 inches: incorporate with normal tillage operations. 2-8 inches: incorporate with chisel or moldboard plow. More than 8 inches: spread or remove to a depth of 8 inches or less and incorporate as listed above. Tillage in the native soil should be the depth of the sand plus 1.5 times the depth of sand; for example, you would till 10 inches deep for 4 inches of sand [4 + (1.5 x 4) = 10]. Avoid tillage or other field operations until soil is dry enough to reduce the chance of compaction. The degree of erosion can vary from a few inches to many feet and different levels will need to be managed differently. Earth Moving – if erosion is too deep to be corrected with tillage, but can be filled, then farmed. Fill eroded areas or top dress with native soil from other parts of the field, depending on the depth of the erosion. Abandonment – may be the only option if erosion is too deep to correct economically, even with earth moving. If you’re using sediment depositions to fill eroded areas, use native soil from another area in the field for the final three feet to avoid droughty areas. Avoid field operations until the soil is dry enough to reduce chances of compaction. After major eroion repairs, sample the soil in the repaired area. (Consider sampling from both the repaired area and undisturbed area to determine if fertility should be managed differently in each.) Use traffic lanes if making multiple trips in the same field to correct erosion. Soil Crusting. Surface soil texture changes and the loss of structure can cause effects resembling compaction. This can restrict root penetration and reduce water infiltration. Tillage should remedy a shallow (less than 2-inch) crust. You guessed it… don’t do tillage when the soil is too wet! Aerial seeding success depends on timely rains and may not be as effective because of a lack of seed to soil contact. However, this does allow the earliest seeding in a field where ground operations might be impossible. The whole field can be done at once, regardless of conditions. Broadcast seeding followed by light tillage provides better seed-to-soil contact, but is dependent on being able to get into a field. Often the whole field may not be seeded at the same time. Drilling gives the best seed to soil contact and seed distribution which leads to more rapid germination and establishment. Also, drills may provide some soil smoothing and cause less compaction than tillage to incorporate seeds. Besides reducing wind erosion, cover crops significantly increased corn yields (+30 bu/ac) but not soybean yields in 2012 on ground that was flooded in 2011. We don’t know if cover crops will have the same effect on yields in a flood of shorter duration. This study was conducted on a field that was under water for over three months in 2011. There are many other management decisions such as tillage, fertility recommendations, cover crop termination, inoculation, seeding practices, and weed control that require special consideration following a flood. These topics and others will be addressed in future CropWatch flood articles. For more information on these topics and other flood related issues, go to https://flood.unl.edu, including the Crops section.